Rías Baixas Albariño: "The Number One Alternative to Chardonnay"
Mr. Oldman shared this sentiment at the Succotash Restaurant in Washington DC as Wines of Rías Baixas attempts to raise the profile of Albariño from the Galicia region of northwestern Spain. Last month they sponsored The Tastemakers Table, where "top sommeliers and wine experts teamed up to challenge palates showcasing the versatility of this Spanish white wine". 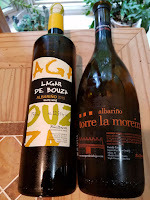 After attending the Succotash event I also received samples of the 2015 Lagar de Bouza ($18) and the 2015 Marques de Vizhoja Torre la Moreira ($17). Whereas the exact nature of Rías Baixas Albariño depends on which micro-climate the grape was grown, both of these wines share the common characteristics that make all Albariño an excellent and versatile wine: minerality and bright acids. Absolutely try these two wines. The next Rias Baixas sponsored event occurs this Thursday May 4th during the Snooth-Rías Baixas Virtual Tasting at 8:30 PM ET. Snooth’s co-founder Mark Angelillo will be joined by Advanced Sommelier Jill Zimorski to discuss ten of the region’s premier Albariño wines. I suspect they will also be discussing the five distinct sub-regions as well as the unique trellis system and marine influences. So grab a bottle of Albariño and join the discussion. Cheers. 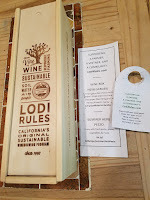 In 2005 the Lodi Winegrape Commission implemented California’s first 3rd party-certified sustainable winegrowing certification program with The Lodi Rules™ for Sustainable Winegrowing Program. The program is accredited by Protected Harvest and certifies sustainable management of the ecosystem, soils, water, business practices, human resources, and pest control. There are 101 measurable standards that emphasize sustainable measures such as reduced pesticide risk to farm workers, consumers, and wildlife. Lodi is home to over 80 wineries and over 36,000 of the approximately 100,000 acres of premium wine grapes are certified green. 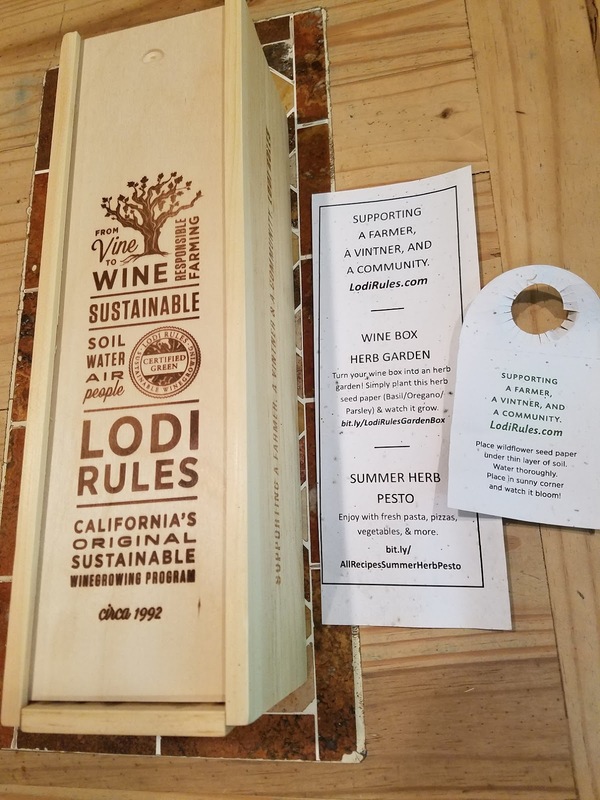 April is Down to Earth Month in California and to celebrate the month and Lodi Rules™ LoCA created a wine kit containing a wine made from Lodi Rules™ grapes packaged in a reusable wine box. 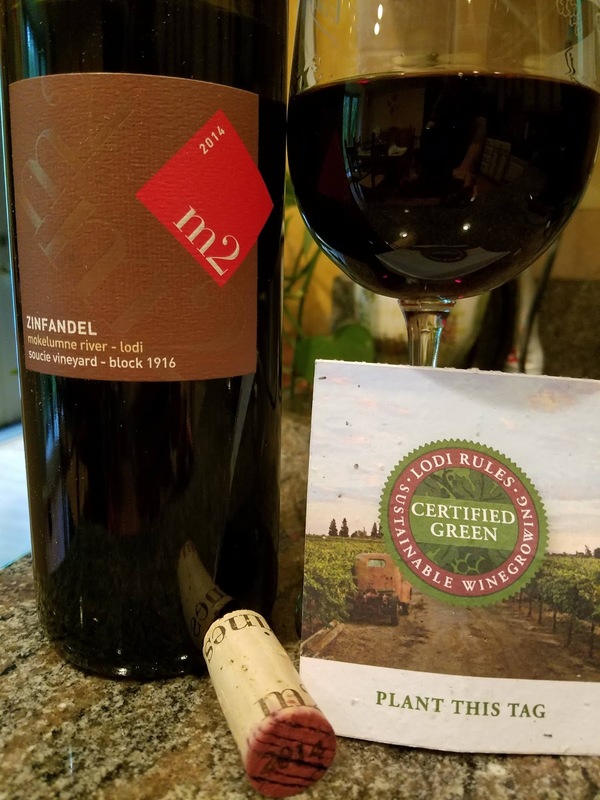 The package I received contained the 2014 "Old Vine" Zinfandel, Soucie Vineyard - Lodi, Mokelumne River, Block 1916 ($30, 15.7 abv) from m2 wines. The wine is excellent: big, chewy, and assertive; cherry cola and spices; with a hot chocolate finish. The zinfandel vines were planted in 1916 by Edward Soucie and is now managed by his grandson and fifth-generation Lodi native Kevin Soucie. As a bonus the kit included not only herb seeds for the wine box that can be re-purposed into a kitchen garden, but a compost bottle tag embedded with sunflower seeds. Let the garden growing begin. Cheers to Lodi Wine and Lodi Rules. Portuguese Port is rather redundant since thanks to the European Union Protected Designation of Origin guidelines most wine labeled as "Port" or "Porto" must be a fortified wine produced exclusively in the Douro region in the northern provinces of Portugal. This may not always be the case outside of Europe, but most countries are accepting the Portuguese Protected designation of origin. 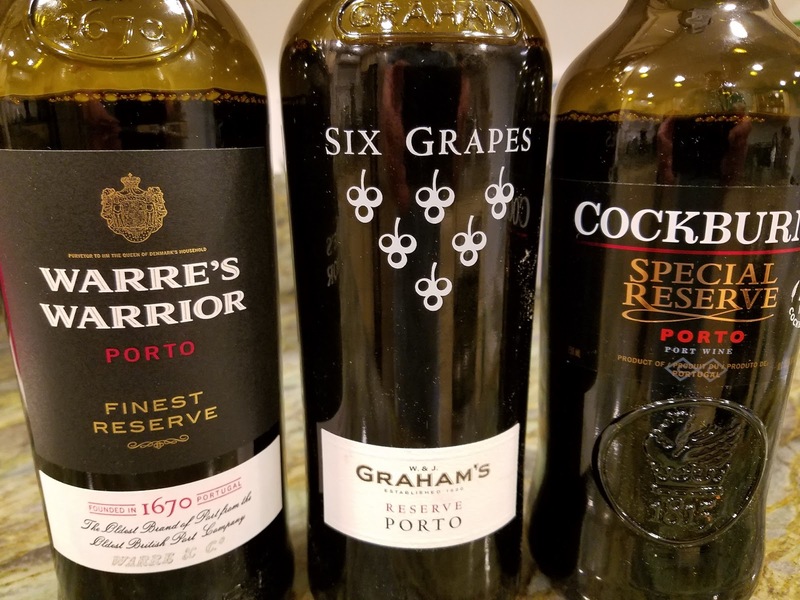 Port wine is a classic style -- produced from grown and processed in the Douro demarcation and fortified with neutral grape spirit. There are over a hundred sanctioned grape varieties eligible for Port, but in general, expect the use of these five: Tinta Barroca, Tinta Cão, Tinta Roriz (Tempranillo), Touriga Francesa, and Touriga Nacional. There are also several categories of Port: White, Tawny, Ruby, Reserve, and Vintage. (See The Wine Coach for specifics.) Ruby Ports are aged in large vats for two to three years before bottling whereas Vintage Ports are from a single harvest designated as an exceptional year and aged additional years in the bottle. The Reserve Port category was created by Cockburn's (founded in 1815) to bridge these two styles where the wine is aged longer in large barrique casks. The goal was to create a wine similar in quality to the Vintage Port but drinkable early like the Ruby Port. Symington Family Estates is a major player in Port as well as Douro Valley wine production, owning several brands such as Cockburn's. I recently received samples from three of their brands described below. Cockburn's Special Reserve Port ($18). This is apparently the world's most popular Reserve Port and is considered "The Original Reserve Port". The wine is produced from grapes harvested from their Quinta dos Canais vineyards in the Upper Douro and aged four to five years in oak casks. And this port is a great baseline for beginners. It is full bodied, with lush fruit and nut flavors, savory spices, a big mouthfeel, and a very healthy finish. Warre's Warrior Port ($19). Warrior is the oldest continuously bottled Port brand (1750's) as Warrior has been branded on the casks of Warre’s finest Reserve Ports since the earliest days of the firm. The grapes are drawn from Quinta da Cavadinha and Quinta do Retiro, Warre’s best quintas in the Pinhão and Rio Torto valleys that also produce Warre’s classic Vintage Ports. The wine is fruity and chewy, lot's of texture, with another long lingering finish. Apparently the higher altitudes and cooler climate lead to this ripe fruit character. For full bodied, yet fresh, easy drinking Port wine, start here. Graham's Six Grapes Reserve Port ($24). "The distinctive depiction of the six bunches of grapes on the bottle originates from the marks long-used in the Graham's Lodge to classify the quality of the wines in the casks. The six-grapes symbol is Graham's age-old mark of quality, used to identify the very finest wines from the best vineyards, which were destined to make up the Vintage Port or Six Grapes lots". The grapes are sourced from five vineyards that are responsible for the brand's Vintage Ports, including Quinta dos Malvedos. The wine was the freshest of the trio, vibrant acids mingling with the dark blackberry fruit. The finish is long and clean. Well done. 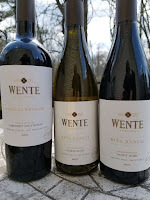 Wente Vineyards, California's oldest family winery, uses their Single Vineyard series to showcase the winery's plots in the Livermore Valley AVA and Arroyo Seco, Monterey AVA regions. "Both regions provide climate patterns that are beneficial to wine grapes, which need warmth for healthy growth, maturation, and development, and cool nights and mornings to retain delicate flavors". The Livermore Valley is located twenty miles east of the San Francisco Bay, which along with Pacific marine climate, provides cool and foggy mornings (hence our favorite Morning Fog wine). The morning fog transitions to warm midday temperatures before early afternoon breezes and evening fog lower temperatures again -- preserving the fruit’s natural acidity. 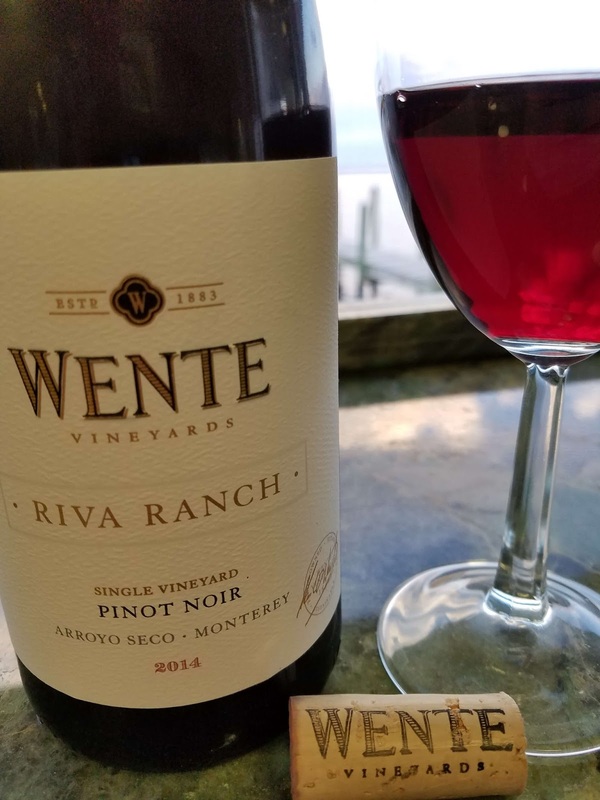 In 1962, Karl L. Wente planted some of the first vines in cool climate Arroyo Seco with the eastern part, influenced by the Salinas Valley winds, providing excellent conditions for growing Burgundy grape varieties. The vineyards also contain river stones deposited over the years which retain and release heat as well as providing excellent drainage. 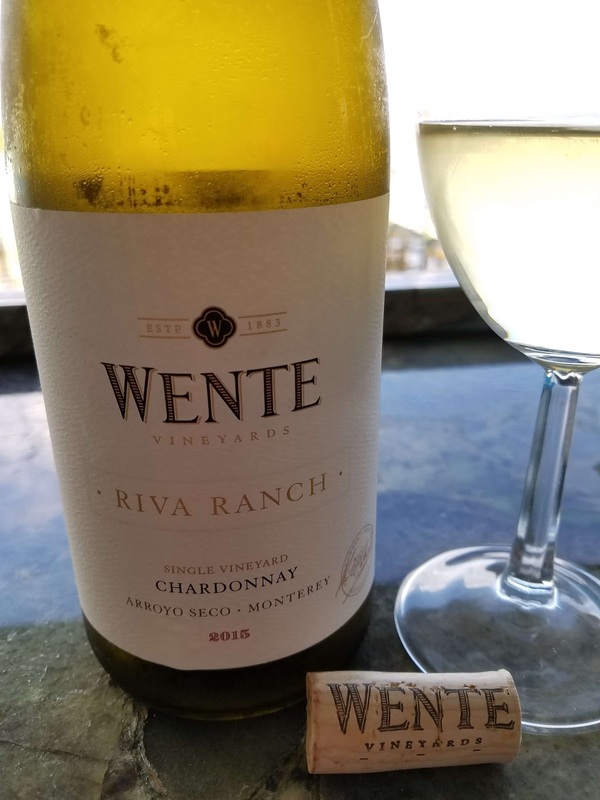 2015 Riva Ranch Chardonnay ($22, 14.5%). Wente is synonymous for Chardonnay after bottling the first varietally labeled Chardonnay in 1936 and creating a series of Wente clones that now account for 80% of all California Chardonnay. The grapes are soured from the Riva Ranch Vineyard in Arroyo Seco, Monterey with 90% fermented in barrel with all undergoing 100% malolactic fermentation and is barrel-aged sur lie for 8 months with batonnage (stirring) occurring every two weeks. This process produces a well textured and creamy wine with noticeable vanilla and spices from the oak. Initially this creamy texture and vanilla seem to overwhelm the palate but quickly the grape's acidity brings the wine into balance. 2014 Riva Ranch Pinot Noir ($30, 14.50%). The Pommard and Martini Pinot Noir clones are soured from the Riva Ranch Vineyard in Arroyo Seco, Monterey. Each clone provides a distinct character to the wine, the "Pommard is especially fruit-driven providing bright lusciousness while Martini is more subtle with layered complexity on the nose and silky texture on the palate". The wine is also aged for 16 months in French and neutral oak barrels. This aging process provides a rustic quality and doesn't overshadow the light cherry flavors. And like the Chardonnay, expect bright acids for a long and smooth finish. 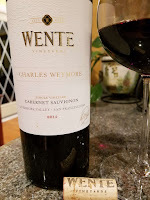 2014 Charles Wetmore Cabernet Sauvignon ($30, 14.50%). The grapes are sourced from the Livermore Valley's Charles Wetmore Vineyard. 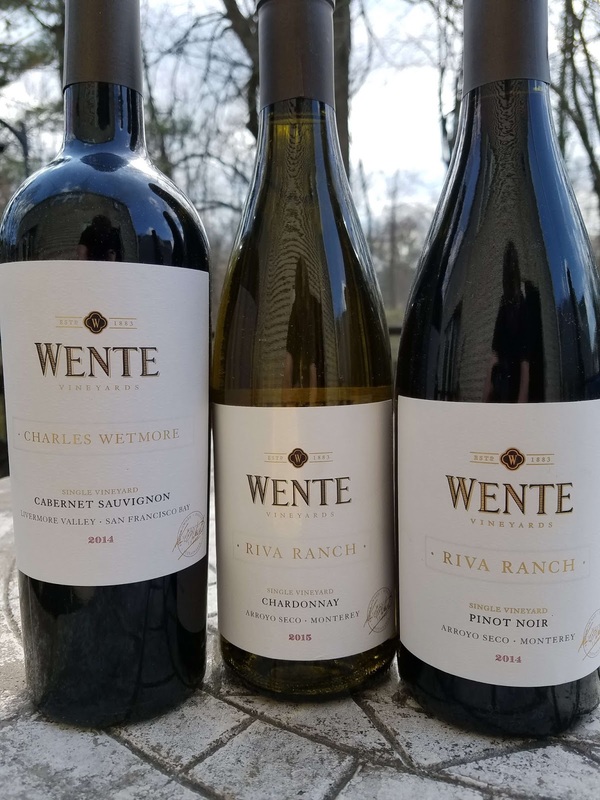 This vineyard is named for "Livermore’s most prominent pioneers, California’s first Agricultural Commissioner, renowned for planting vine cuttings from many of Bordeaux’s top Chateaux in the Livermore Valley in the 1800s". 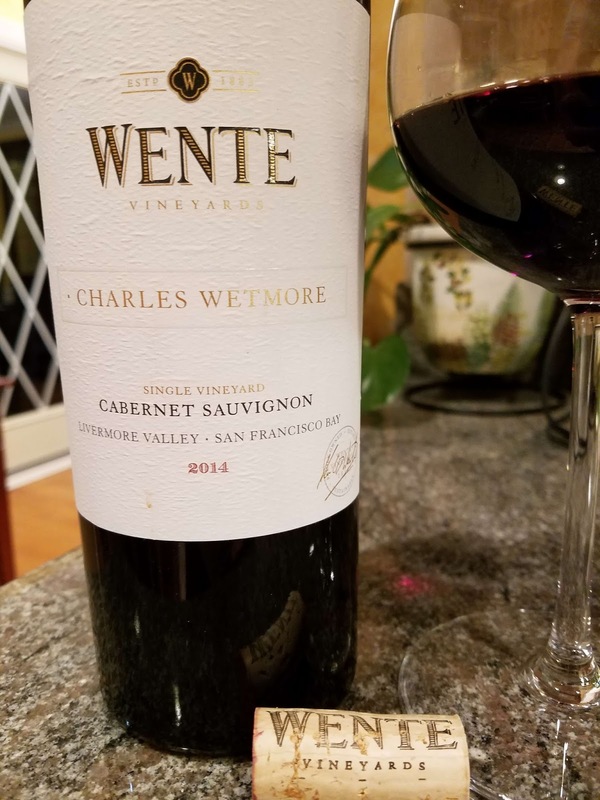 The Charles Wetmore Vineyard contains gravelly loam soil similar to those in Bordeaux and the grapes for this wine are direct descendants from the vines first planted by Wetmore. After fermentation the wind is aged for 20 months in 40% new French oak and 60% second and third use French oak barrels.The result is a fantastic wine, fresh fruit, smooth velvety tannins, and a long fresh finish. Simply fantastic. It can pass for a Napa Cab at twice that price.